AX3116 consists of step-down switching regulator with PWM control. These deviseinclude a reference voltage source, oscillation circuit, error amplifier, internal PMOS and etc. 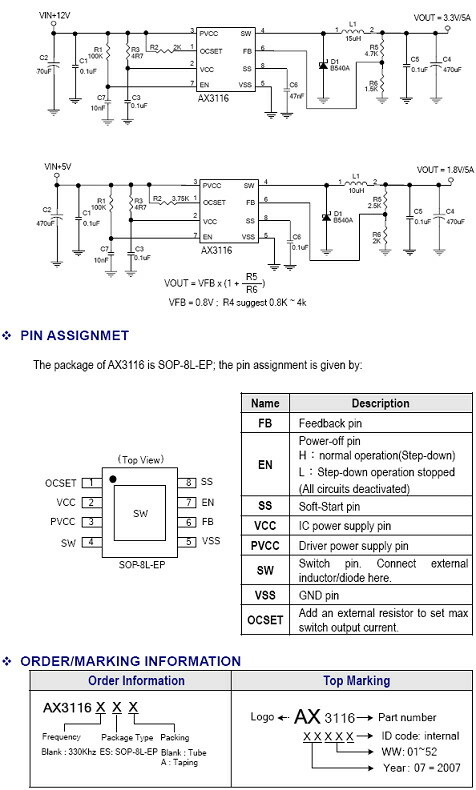 AX3116 provides low-ripple power, high efficiency, and excellent transient characteristics. The PWM control circuit is able to the duty ratio linearly form 0 up to 100%. An enable function, an over current protect function and short circuit protect function are built inside,and when OCP or SCP happens, the operation frequency will be reduced. Also, an internalcompensation block is built in to minimum external component count. With the addition of an internal P-channel Power MOS, a coil, capacitors, and a diode connected externally, these ICs can function as step-down switching regulators. They serve as ideal power supply units for portable devices when coupled with the SOP-8L-EP package, providing such outstanding features as low current consumption. Since this converter can accommodate an input voltage up to 23V, it is also suitable for the operation via an AC adapter.